Got a slightly unorthodox new bundle of fun? She (or he!) is going to need a name just as whackadoodle as she is. Never fear! SheKnows is here! Cult films may not always be blockbusters. Heck, a lot of them barely broke even (if that). But they all have one thing in common — group of devoted followers as dedicated to the movie as you are to your pet. Don’t they deserve a name as special as they are? 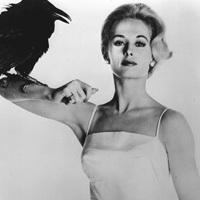 This adorable name actually comes from a cult classic by director Alfred Hitchcock, who was just a bit infatuated with actress Tippi Hedren, the leading lady in The Birds. It’s the perfect name for any small dog or extra-prissy cat. Who can forget the lovable Martin Q. Blank? Certainly not the people this talented hit man with a heart offed! No matter what kind of pet you have, if the stars just seemed a bit too aligned to ignore when you adopted your furry (or not) friend, give it a name from the cult classic Grosse Pointe Blank. If there’s something strange in your neighborhood, who ya gonna call? Since the Ghostbusters don’t actually exist, we’d recommend your loyal and extremely protective pooch, and you can name him after Bill Murray’s Ghostbusters character Dr. Peter Venkman. Just about any animal can take on this classic works-too-hard-to-be-a-slacker moniker. Even a goodie-two-shoes like Jeanie Bueller has a soft spot for the lovable title character from Ferris Bueller’s Day Off. If you’ve got a slithery new pal, go with Robin — as in Sir Robin the Not-Quite-So-Brave-as-Sir-Lancelot from Monty Python and the Holy Grail. Let’s face it. A python named Monty is just a bit too on the nose. Bruce Campbell is better known to the TV crowd as Sam Axe, the alcohol-loving womanizer with a reluctant heart of hold from TV’s Burn Notice. But before that he was Ash Williams, the chainsaw-armed protagonist from the Evil Dead series. While this name works well for any animal, we think it’s most appropriate for the consummate bada** pets — a military dog or a cat that brings one too many “presents” to your porch steps. At least you can get your precious furry gremlin wet (though we still don’t recommend feeding him after midnight!). Name your sweet fuzzy pup or kitty Gizmo. If they’ve got a bit of a mischievous streak, go with Mohawk. Feather babies deserve fun names, too. Name your parrot or songbird after the beloved title character of Hudson Hawk, played by Bruce Willis. Bonus points if you teach your songbird to sing “Swingin’ on a Star” or your parrot to order a cappuccino. That big dopey dog couldn’t hope for a better namesake than the loyal giant Fezzik from The Princess Bride. Name his pal the chihuahua or Mexican hairless after the Spanish sword fighter with terrier-worthy determination Inigo. What are your top choices for pet names from cult films? Tell us in the comments below!